The second morning, I manage to sleep until 6 o’clock and I feel better for it. Light already lies over Seoul when I drink my coffee and the view is still magnificent. This morning when we get off the subway we are still some distance from our destination, Bukchon Village, but we enjoy walking the streets. At a hole in the wall we pause to buy grilled chicken skewers to stay our stomachs until lunchtime. 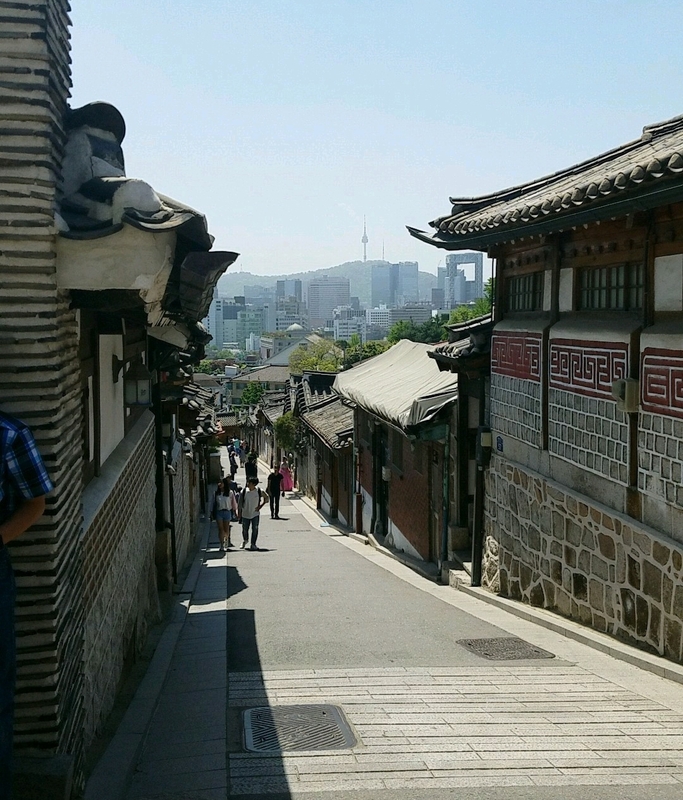 We enter Bukchon Village gradually, and the streets become steeper and narrower, closely lined with small ancient houses. Most of them are private residences, but from the outside at least they look just like you’d expect old Asian homes to look: stone and brick walls, rows of tiny many-paned windows, and curving tile roofs. At the top of one particularly long street we stop to look back, out across the city to Seoul Tower on an opposite hill. By the time we’ve walked all the way back down, we are tired and choose to take a bus towards our barbecue lunch. When you eat Korean barbecue, the meat gets grilled in the center of your table. As with every Korean meal, there is water in darling cups and up to a dozen side dishes scattered over the table, all full of flavor, most a little mysterious. This is where the foodies in our group shine. I try everything once, and then proceed to eat the things I enjoy. And there’s actually quite a lot of them. We spend a lot of day two wandering the endless, and endlessly fascinating, Seoul streets. You never know what your eyes will behold next in this city. 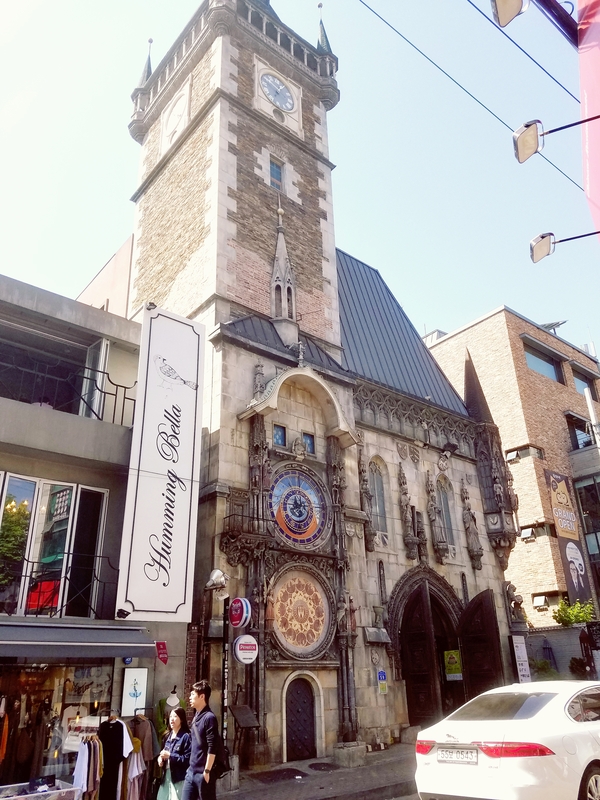 On one street we find a solid black Lamborghini, parked for so long that people have written in the dust on it; on another stands a narrow, gothic-cathedral-looking edifice complete with a soaring clock tower, which turns out to be the Castle Praha Hongdae; and on a third appears a large, square white building, smooth with nothing on it but doors and the words GENTLE MONSTER. One thing you can count on your eyes beholding: coffee shops. The first coffee shop in South Korea opened in 1902; today there are well over 18,000 in Seoul alone. That comes out to a coffee shop on nearly every street, ranging from Starbucks to tiny artisan shops with delightful names. We pause in front of one called Coffee Me Up to inhale the scent, and when Trennis sees that they roast their own beans he cannot resist entering. He is quickly followed by certain other coffee lovers, and when we finally continue on our way there are several coffees among us. Korean coffee is rich and strong but smooth on my tongue, and I find myself loving it. It’s a little bit delightful when I suddenly recognize the streets and know where I am. We’re almost ‘home’. In the early evening we take an hour-long subway ride to meet Olivia’s former foster parents and some of their family at a Chinese restaurant. Olivia’s Omma and Appa are an elderly Korean couple but even now they have two tiny girls in their care. They are so excited to see Olivia they can scarcely contain it, especially Omma, who has a paper where she has written down things like the names of Olivia’s best friend and cousin so she can ask Olivia how they are doing. It’s sweet and a little sad to see how much they love her still. After eating, we go to a nearby coffee shop with a play area where they used to take Olivia, and we drink more Korean coffee and watch the little girls play. When the time comes to go, Olivia wants to take the little girls home with us. My day begins and ends with the view from our window: breathtaking in the morning, but magical at night.